Even though Chicago Blackhawks forward Andrew Shaw is an undersized 5-foot-10 and 180 pounds he can be nuisance for opponents with his fists, his physical play, his mouth, and in big games his stick. He continued to prove his worth with the game-winner in triple overtime in the Stanley Cup final opener. 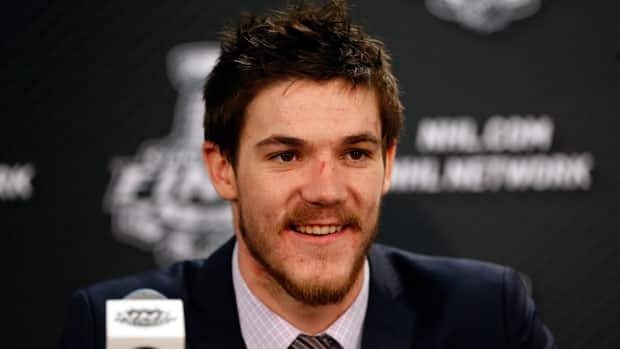 CHICAGO -- Chicago Blackhawks third-line right wing Andrew Shaw is an agitator, a pest, a shift disturber, and and he's from Belleville, Ont., the hometown of the most famous Blackhawks player, Bobby Hull. Even though he's an undersized 5-foot-10 and 180 pounds he can be nuisance for opponents with his fists, his physical play, his mouth, and in big games his stick. The Boston Bruins found this out when Shaw got his stick on a shot from the point that already had deflected off the shin pads of linemate David Bolland to score the game-winner in triple overtime to end the fifth-longest game in Stanley Cup final history. "Bollie, I love you. I love shinpads," Shaw, who was miked for television, said in the celebratory scrum. "I think you could ask players on other teams and they'll tell you that he's not the type of guy that they like to play against," Blackhawks captain Jonathan Toews said. "But that's what we love about him. "We love having a guy like that on our team. He's not afraid. You saw him going up against [Zdeno] Chara [in the series opener]. Probably the guy on our team that got up against him the most, hit him. Stirred him up a little bit, drew a penalty, scored a huge goal, unbelievable goal. "Big game by this guy. I don't know if he had like nine, 10 hits, whatever it was, but he kept going all night and didn't stop." Shaw was credited for nine hits to be exact. And like Toews said, he was a thorn in the side of the 6-foot-9, 255-pound Chara on Wednesday, in a game that spilled into Thursday. "He's a competitor," Chicago coach Joel Quenneville said. "He does things game in, game out. The bigger the stage, the bigger the challenge. He rises to the occasion. He knows where the front of the net is. It doesn't have to be pretty. He's a warrior. He's one of those guys that you appreciate he's on your side and he's relentless." In hindsight, you wonder why this guy was passed over in the draft twice. You wonder why, after a wonderful run to the 2010-11 OHL title with the Owen Sound Attack (10 goals in 20 games) and an even better Memorial Cup (two goals, seven points in four games) Shaw was still around in the fifth round when Chicago selected him 139th overall. "I sit next to him," Blackhawks forward Patrick Kane said. "There's times where I almost got to tell him to shut up because he just asks questions and doesn't stop talking when you're next to him there in between periods. "He's really excited to be here. He's a kid that I think he got passed over twice in two drafts. We picked him up in the fifth round. He came in the next year and played. Speaks to his character, how he can put all that behind him and come in and play in the NHL right away and really be a factor. He does a lot of good things for us, whether it's hits, being an agitator, even scoring goals. He probably scores more goals off his shin pads than he does his sticks. I'm sure he'll take them, and we will, any way we can get them." There were concerns about his size and that he was nothing more than a small pest on skates. But the Blackhawks and the rest of the NHL found out otherwise in his NHL debut back on Jan. 5, 2012. Thirty-five family members and friends, including his parents, Darlene and Doug, boarded a bus for the seven-hour trip from their Belleville home to Philadelphia to watch Shaw in his first NHL game. He didn't disappoint. He fought Zac Rinaldo on his second shift. He was bloodied and needed stitches. He returned and scored early in the second period. Owen Sound general manager Dale DeGray and then head coach Mark Reeds, now an assistant coach with the Ottawa Senators, saw this sort of talent a few years ago. So when forward Steven Shipley wanted a change of scenery, the Attack landed Shaw, along with defenceman Matt PetGrave and three draft picks from the Niagara IceDogs in exchange for Shipley. There's no denying Shaw's passion for hockey. Once, when he was 11 years old, he tried to hide from his parents a broken hand so he could continue to play. After he was fitted with a playing cast, he scored five goals in the next game. Sure, every once in a while Shaw's belligerence gets him into trouble. Just ask his older sister Alex, or his brothers Jason and Josh, or his parents about the countless scraps Andrew got into as a kid growing up in Belleville or at the family cabin at nearby Robin Lake. Doug Shaw, who played for the Belleville Junior A Bobcats in his day, tried to change his hyperactive son when he was younger. But he gave up. The Blackhawks are thankful. "Oh, he's a handful in the dressing room, too," Chicago defenceman Brent Seabrook said. He's a high-energy guy. He likes to have fun, get guys going, jumping around the room, bouncing around. He's pretty much the same he is on the ice, just without skates on." Late in the OHL final against Mississauga two years ago, Shaw was suspended for the final two games after he slugged opponent Chris DeSousa late in a Game 5 loss. It hurt Shaw to sit and watch those last two games. But his teammates bailed him out with a championship. Maybe he has learned from his wayward ways. He's still a pest, but he has stayed on the ice, and now the 21-year-old has been lauded for walking the fine line of being of a hockey agitator. "I take it as a compliment," Shaw said. "It's how my game has developed throughout my career. It's what's got me here. I got to stick to it, just compete and work to the best of my abilities."